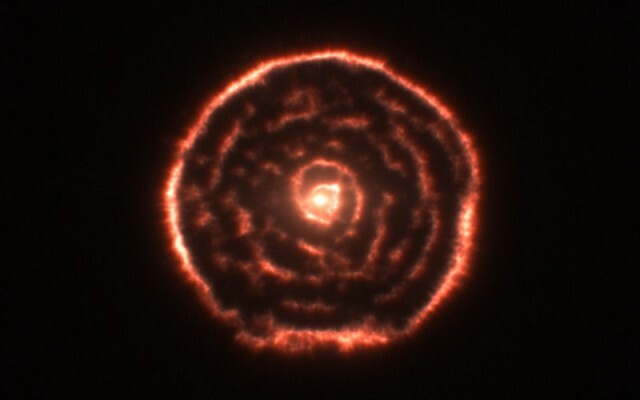 The ALMA telescopes found a spiral pattern surrounding the dying star R Sculpturis. Though it may seem sad on the surface, the death of a star is a beautiful thing—and an important precursor to the birth of new stars and planets. The Atacama Large Millimeter Array (ALMA) in Chile has provided a breathtaking view of a star nearing the end of its life. One unexpected feature was a lovely spiral pattern that probably indicates the presence of a hidden companion. This entry was posted in Ars Technica, Writing for Other Sites and tagged ALMA, astronomy, stars.